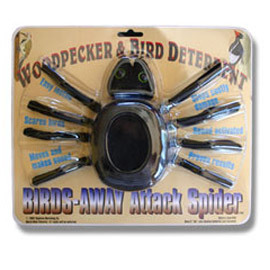 The BIRDS-AWAY Attack Spider® is a battery-operated device that will chase away damage-causing woodpeckers. Activated by sound, the spider drops down on an 18 inch string while making a loud noise. Then it climbs back up the string, ready to attack again. This unusual solution is both very inexpensive and highly effective. Woodpeckers cannot stand them!